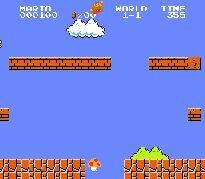 THE NeTw0rK :: Do You Play too Much Super Mario Bros? Do You Play too Much Super Mario Bros? Super Mario Bros. was the game that most people think of when Nintendo is on their mind. Mario and his twin brother, Luigi, are Italian plumbers who have to find the kidnapped princess. See if you're addicted to this game by reading our list of symptoms to look out for. No matter how hard you try to get it out, the theme song is just stuck in your head forever. You subscribe to Nintendo Power. You are convinced that consuming mushrooms will make you grow taller. Whenever you see a turtle, you instinctively want to jump on it. You think Princess Toadstool is hot. You jump up and bump your head in low-ceilinged rooms, and tell everyone you're trying to "get coins."